Maryam Maquillage: Spring Bling Nails! Soo Nails Nail Lacquer in Silver Down #s90 (chrome silver) -- silver chevron tips done in two easy diagonal swipes. Milani Jewel FX Nail Lacquer in 530 Jems (chunky mixed rainbow glitter) -- just two coats of this bad boy result in a very dense glitter finish. I applied the glitter polish over one coat of the bright mint polish on the accent fingers and over one side of the chevron tip. Duri Rejuvacote Nail Growth System (base & top coat) -- I always indicate the same product in my nail posts, but still get so many questions about what top coat I use lol... so voila, this is it. And yes, it is both a base and a top coat :)) Click on the link to get yours!! Spring nail colors, for me, are all about making the transition between the winter and the summer... kind of an obvious concept, if ya ask me :)) In the winter time, I tend to wear a lot of neutral and pale colors, whereas in the summer, I go all out with neons and brights. For the spring time, it just makes sense to go with pastels and amped up neutrals, and the the exact opposite is true of my darker autumn choices. Check out some of my past seasonal favorites and click on the pics for tutorials and more info. This Spring, I'm jazzing up my bright pastel mint green with some rainbow glitter bling!! Just look how it shines!! Chi-chiiingg!! What nail colors do you choose for Spring? 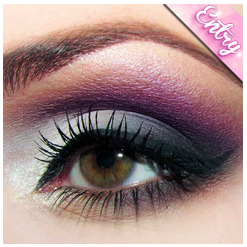 P. S. If you're not a member of MakeupBee, you can join via FB. This post is awesome! The combination of sparkles and light pastel type colors fit perfectly together, especially for spring time. Great post! so pretty, did you color your hair? I'll have to join makeupbee. Bling bling indeed! Though, this post just reminded me of my love affair with your birdie tracks nails!! SO CUTE!!! and I'm glad you did :)) thanks love!! It's very beautiful !!! I love it !! Wow !! Beautiful nails ! 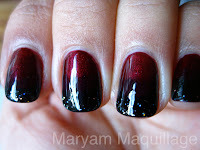 I really love this glitter manucure ! Great Post ♡ ,love the Nail Design! This is so cute! I love the bright mint color, it really makes your nails stand out. hey sugar!!!! love the spring freaken BLING!!! lol :) thanks for sharing!!! Please do more nail posts. soo beautiful I love the nails and the yellow makeup on your eyes sooo gorgeous!! love the colors! i've seen those milani nail polish's at the store but didnt know what they were like- now i'll have to try them! YOu have to try them, they're great!!! Your nails are ALWAYS inspiring!! LOVE this!! I need to get that milani multi color glitter!! It would look great with so many colors!! Hi :) There's an award for you on my blog! Congratulations. P.S. I ♥ your nails. I....am totally in awe! As usual your nails are freakin' spectacular. ; w ; And your eye makeup in the face shots! Love! thanks dahling :)) I'm wearing my new favorite yellow eyeshadow--Goldfish by Lime Crime! Really cute nail..... I love it Miryam <3 smuak! Dinorah YES!!! The Milani polishes are incredible!!! wow! Stunning,colorful & kaleidoscopic. Maryam you never cease to amaze always creating something out of the blue ! Have a great Sunday. awesome! You know i'm a total nail freak and theses are great!!! Amazing nail arts! Love it!! this nail art is very inspiring, you have an amazing talent. Beautiful and original!!! See you soon. Xoxo V.V. Wow, such a great idea!! Love it! Would love for you to come check out our blog!! Awesome! 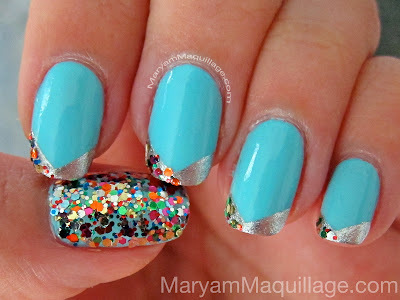 I am in love with that lovely, minty colour and the HUGE glitters!